Accurate and fast pH measurements in aqueous samples depend on the right electrode and on keeping sources of error to a minimum. This pH measurement guide contains much useful advice on how to achieve reliable results. For over 100 years, pH has been measured in practice to determine the acidity or basicity of samples like water. Due to the high reliability, sensitivity, and fast response of this analytical parameter, as well as the relatively low cost of the equipment needed to measure pH, it remains a widely used and crucial measurement parameter in many industries today. And yet, even though measuring pH in the laboratory is a common analysis, many things can go wrong. 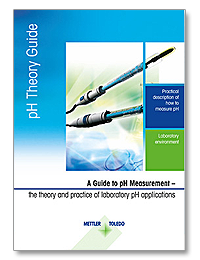 The guide provides all the important basics that are necessary for a good understanding of pH measurement. Furthermore, all the vital factors that influence the measurement and possible sources of errors are discussed. This booklet is not limited to theoretical aspects. It also contains a substantial practical part with step-by-step tutorials and guidelines for reliable calibration and measurements, descriptions of specific applications, and more. The last section of this guide provides you with a selection of frequently asked questions and the respective answers. Understand every aspect of your workflow in order to identify and minimize potential errors in pH calibration and measurement!